Hi! It has been over four months since my last post, and I am excited to get back into regular recipe testing this summer! I traveled extensively for work this winter and early spring, and am still getting back into the swing of my normal cooking and workout routines. I have not been very creative with my meal planning these last few weeks, and have been sticking with mostly boring salads, lettuce-wrapped burgers and Mexican take-out food. Sometimes I forget how delicious the most simple recipes can be, like this cauliflower turnip soup. This soup is one of my favorites, and is reminiscent of a creamy potato soup. Soup is not something I would normally crave this time of year, but the weather has been dreary this week, and is currently in the 60s, so this soup fit the bill. 4 strips of bacon, cooked and chopped (for garnish). Reserve bacon grease. 1. Bring water to a boil in a steaming pot and add cauliflower, turnips, garlic and onion. Lightly salt cauliflower and turnips, put cover on pot and steam for 25 minutes, or until everything is fork tender. 3. 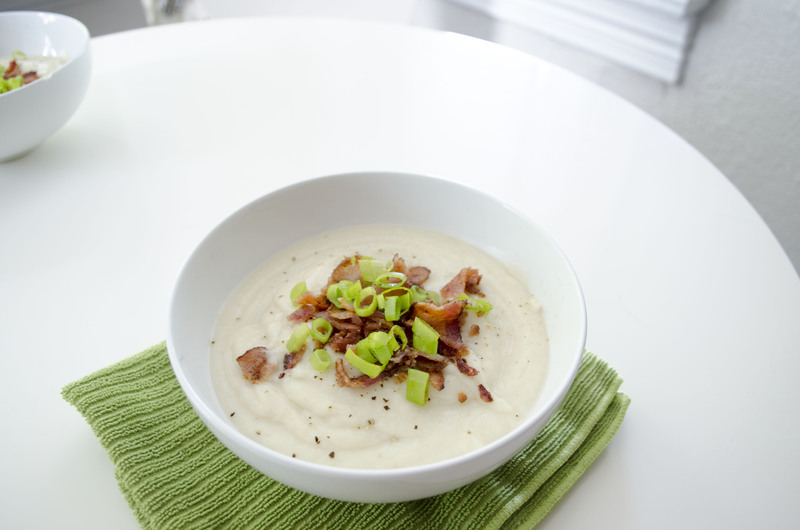 Pour soup in bowls and garnish with black pepper, green onions and bacon.